Fall is the best time for crops from the Brassicaceae family. There are more than 3,200 species in this family worldwide including many of our common crop plants, including broccoli, arugula and radishes. Some of the oldest crop plants are brassicas, and over centuries lots of variation has occurred resulting in a diversity of tastes, textures and growing habits. 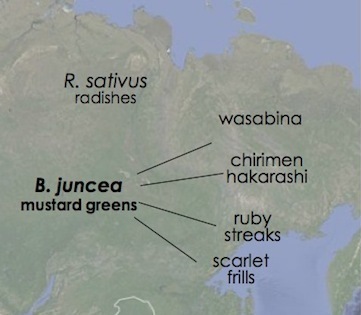 Despite this, there are patterns that all Brassica's have to help identify them. First, all Brassicas have four petals arranged in a "X" or "H" shape. Above are two flowering salad greens - tokyo bekana and arugula. The color and petal shape are very different, but they both have four petals in a cross shape. 'Cruciferae' an older name for the plant family means 'cross-bearing' and described the crucifix shape of the leaves. ('Cruci' also means torture, which some people might feel when they are forced to eat broccoli or brussel sprouts.) The modern name "Brassica" comes from the latin word 'brassic' which simply means cabbage. A second way to recognize brassicas is by their heart-shaped cotyledons. Cotyledons are the embryonic leaves that first appear when dicots sprout. All brassica crops plants have two that are heart-shaped. I assume wild brassicas do to, but this isn't used to ID brassicas in the wild because it's rare to see wild plants when they are so small. What are all these crop plants I've hinted at? Even if you don't like eating them, I'm sure you're familiar with many of them. I'm only going to discuss the varieties that are typically grown in our region. Broccoli, brussel sprouts and kale are all part of this species. Cole crops developed in Northern Europe prior to the Middle Ages - thus the reason why they like moderate, temperate climates. They have developed in all sorts of ways so the edible part of the plant might be enlarged flower heads (broccoli, cauliflower), dense headed leaves (cabbage), or a swollen stem (kohlrabi). Leaves develop a waxy coating as they mature, which is why some varieties can be eaten as salad greens when young, but have to be cooked when they are older. Arugula, Eruca sativa, is not a cole crop, but did develop in the Mediterranean region. Brassica rapa contains many familiar salad and cooking greens. Many of the greens I trialed as part of my master's research were varieties of this species. Typically these greens are mild flavored, high in nutrient content and can have thick, crunchy petioles (stems).